Many Americans across the nation have been shaken up by recent violent attacks in Colorado at a movie theater, in Wisconsin at a Sikh temple and now New York, just outside the Empire State Building. Are citizens of these states more concerned about violence than the rest of the nation? So what types of places have Americans thinking twice? Where might they avoid if possible? Despite TSA attempts to make airports safer, 2 in 5 Americans are still concerned about random acts of violence at these travel hubs. Shopping malls (33.1%) were the next highest location of concern—something retailers should really be aware of heading into the all-important holiday season. Santa’s little helpers might appreciate some added security this year. Places of worship are understandably a big concern in Wisconsin (39.0%) while citizens of Colorado (34.9%) and those in Ohio (33.6%) show elevated apprehension for violence in schools. Whether past or present, vicious attacks such as those occurring in Oak Creek, Wisconsin; Columbine, Colorado; and Kent State University in Ohio still impact the perception of safety in the United States. Overall, those in New York are the most concerned about random acts of violence in public places—7 in 10 admit to concerns about violence in at least one location. 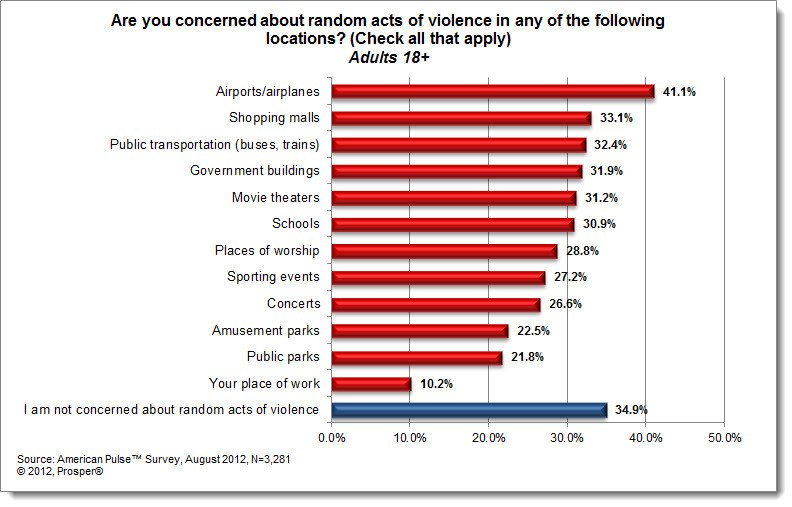 Ohioans are less concerned—37.8% say they are not worried about violence in any public places. Perhaps this state isn’t such a bad place to visit! Does your coffee cup denote how you’ll vote in the Presidential Election? When you are in need of java fix, are you more likely to head to Starbucks or McDonald’s? Did you ever think that the drive-through you pull up to may indicate which presidential candidate has your vote? There’s a lot of mud-slinging in the political arena these days—battle lines have been drawn and it seems like every other TV commercial is a negative campaign ad. So we like to lighten the mood here at BIGinsight™ every now and again and look at some unique voter segments to see how they plan to vote in the presidential election. First up were the coffeehouse titans. I should start by saying that Independent Voters will likely decide the election. The political atmosphere is anything but bi-partisan and Republicans and Democrats appear to be behind their candidate. But Independent Voters who plan to vote in November are split. Our analysis shows that over a quarter of these voters are undecided and therein lies the opportunity for the presidential hopefuls. Likely Independent Voters who still haven’t made a decision are most likely to head to Starbucks. 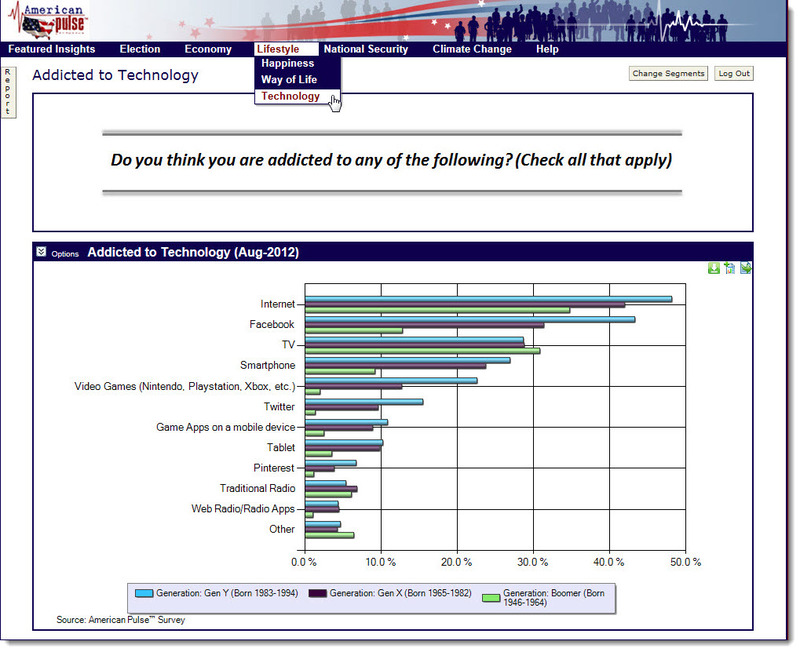 13.9% saying that’s where they purchase coffee most often. McDonald’s comes in at number two among this segment. 9.3% go there most for coffee. 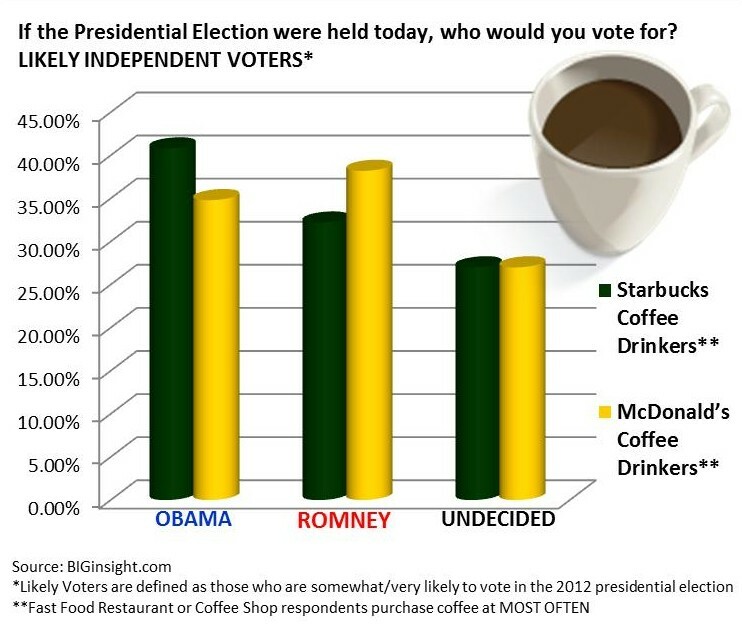 Likely Independent Voters who go to Starbucks most often seem more inclined to cast a ballot for Obama. Those who prefer McDonald’s coffee are more likely to vote for Romney. It’s interesting to note that over a quarter of each voter group remains on the fence and historically unsure votes tend to end up in the challenger’s tally. Once upon a time, Best Buy was a magnet for shoppers. We came, we saw, and we unflinchingly bought. Fast forward to 2012, and Best Buy is seemingly no longer a “best bet” among consumers. The big box made news recently, not because of stellar sales performance, but because of its store closings, layoffs, and failure to evolve with changing consumer needs. Best Buy’s growing reputation as Amazon.com’s showroom isn’t doing much to help the matter, either. – Among Best Buy’s most loyal electronics shoppers, 51.6% admit to surfing Amazon (for any category) within the past 90 days. Fewer (40.6%) perused the offerings at Best Buy during this same time period. Ouch. – On the flip side, among Amazon’s most loyal electronics shoppers, a whopping 92.4% had visited the site within the past three months, while just 16.8% had been curious enough to enter a Best Buy. Double ouch. 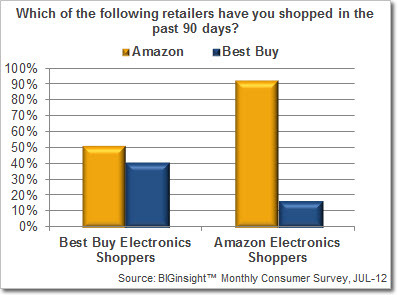 Best Buy’s electronics shoppers were more prone to visiting Amazon within the past 90 days than the big box itself. Winner: Amazon. The online retail threw a hard punch at more retailers than just Best Buy when it introduced the Price Check app. And the intel it receives from Price Check participants ensures that Amazon’s sticker prices remain low – making non-price competition a “must” for other retailers. Does Exercise Incite Positive Thoughts about the Economy? The positive effects that regular exercise can have on our health and stress levels are well-documented; I personally enjoy the solitary time on my elliptical each morning reading Twilight The Changing American Consumer on my Kindle. But can breaking a sweat help boost economic confidence? 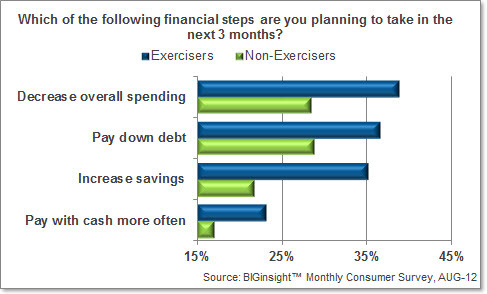 According to our August Consumer survey, 35.2% of those who regularly hit the gym [or pound the pavement?] are “confident” or “very confident” in chances for a strong economy, indexing slightly above the overall average (34.0%). 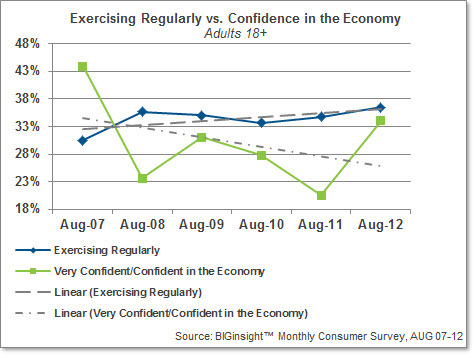 Among those who prefer a more sedentary lifestyle, confidence was subpar (33.3%). 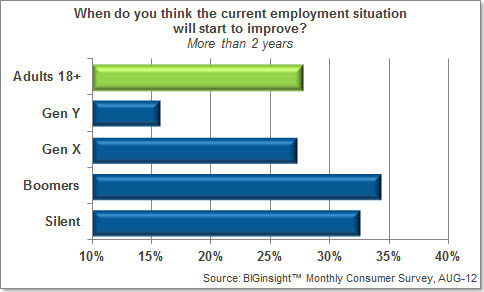 Exercisers are also prone to more positive thinking regarding the employment outlook. 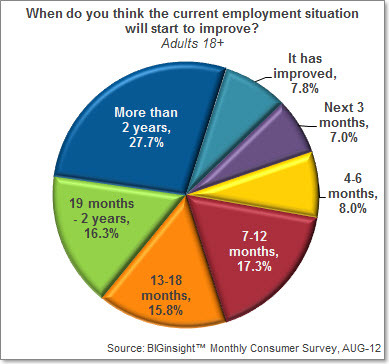 Nearly one in five (19.5%) is calling for “fewer” layoffs over the next six months, higher than the overall average (16.9%) as well as their couch potato counterparts (15.4%). Exercisers aren’t as likely to be sweating increasing layoffs, either; about one in four (26.7%) is expecting “more” layoffs, indexing below adults in general (27.6%) as well as non-exercisers (28.1%). But while exercisers are making more positive predictions for the economy, they are adopting more realistic, financially conservative lifestyles. This month, half (50.7%) of those who work out regularly say they have become more practical in their purchasing, 28% higher than those preferring less active lifestyles (39.4%). Focus on necessities, sticking to budgets, and spending more time with the family are priorities to a higher proportion of those tending toward toning compared to those who, well, are not. Is the economic downturn/exercise upturn a just coincidence? Have we been turning to exercise to help alleviate some of the macro-environmental stress brought about by the Great Recession? Or given the information deluge we’ve experienced via the online, mobile, and social media, have we just become more aware of the benefits of building up a sweat? More motivated? Or with the growing number of baby boomers entering retirement, is a larger proportion of the population trying to stave off aging? Or in this economy, is going for a run simply cheaper than dinner-and-a-movie?